This is what I do most often, by far. 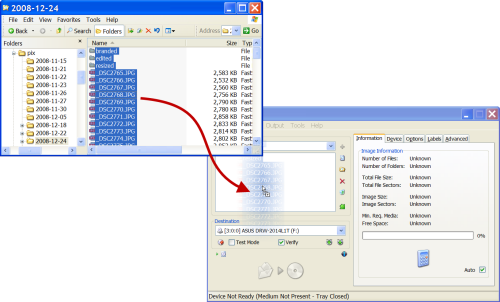 I use CD-R's and DVD-R's (write once media) to archive data and to send data around to others. It's the most common and most compatible format. Note that I've included both files, and folders - whose entire contents will be included. Note that because I've inserted a blank CD, that's allowed ImgBurn to calculate exactly how full that CD will be. The calculator icon is actually a button that you can press at any time to recalculate the space that will be used. By far the most common question next is "what now? how do I make it burn?". ImgBurn will then ask you to specify a Volume Label for the disc, and once you've done so it'll start burning. That's all normally behind the scenes stuff. 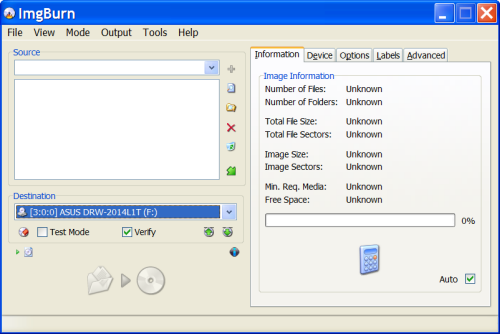 But what if you have an image file in the form of an ISO? You once again click on the largish button on the lower left half of the ImgBurn window to begin the burn. As always, be aware of the size of the data you're wanting to write, and whether it will fit on the media that you have. 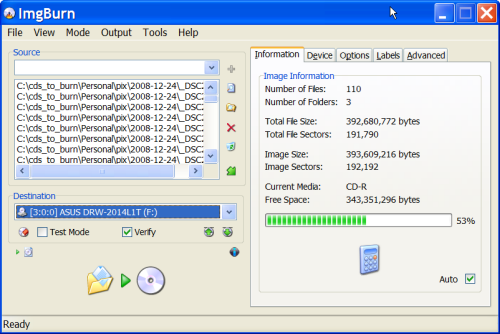 For example, if you have more files or folders than will fit on a single CD, then you may need to break the data up into amounts that will, or perhaps use a larger format such as a DVD instead. If you have an ISO that's larger than a CD, then you have no choice: you need a DVD. ImgBurn, as I understand it, won't create bootable data disks (or if it does, it's beyond the scope of this discussion). If you're burning an ISO, and that ISO is of a bootable disk, then the result will be bootable. 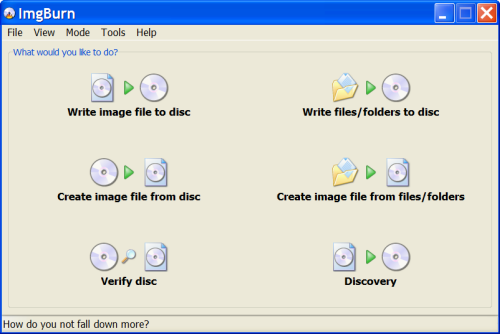 As you can see from the "EZ-Mode Picker" you can also create image and ISO files from existing discs (a great way to backup a copy), or from a selection of files or folders. ImgBurn will create audio CDs as well. There's a How-To at the ImgBurn discussion forums. Those discussion forums are worth mentioning as well, as they're a good resource for not only FAQs and HowTo's, but also serve as support should you have questions about ImgBurn. The bottom line is that ImgBurn is a powerful and full featured CD/DVD and even HD-DVD/Blu-ray burning utility. 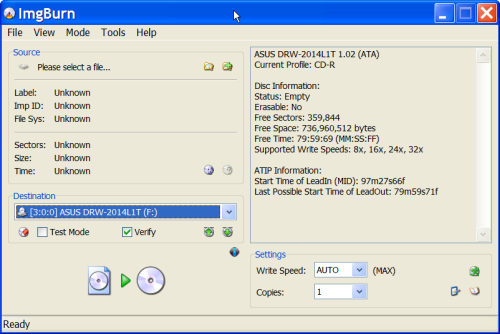 If you've got the hardware to burn a disc, ImgBurn is worth evaluating as the tool to do it. Prtesently I have Roxio on my PC. How does this compare to Ingburn? Also, I have a full dvd that I would like to make copies, family pictures. Do I use a blank dvd disk and will it copy everything? I am confused. Did you say that ImgBurn will burn CDs and DVDs? when I go to the ImgBurn web link I find that the free software only burns CD's . I have to buy the Express Burn "commercial" software to burn DVDs. Am I missing something? Leo! Thanks so much for the AWESOME article on ImgBurn! 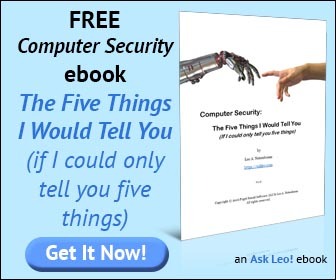 I have used this program for quite a while, also. It more than meets my needs for writing, building, and burning. Your 'how-to" tips were outstanding!!! I always enjoy your newsletters and always learn a lot from them! Keep up the GREAT work!!! Hey, Merso nice link. Now how about the IBM users? free imgburn will burn dvd and cd , i use it all the time. I have just purchased a Toshiba NB 300 notebook. It has Windows Media Player but no burner. In fact it has no facility for loading a disc. Any help wd be appreciated. I amm a novice. I use CDBurnerXP. Works right through to Windows 7. It's free and burns CDs and DVDs, including Blue-Ray and HD-DVDs. I've used a freeware program called DeepBurner for many years. (There's also a paid "Pro" version.) It has similar features, plus you can save a list of files to burn as a "project" so you can come back later and burn another disc with the same files. You can also have multiple different "projects" open at the same time, so you can assemble a burn list for several different disks at the same time. Thanks Again, Leo. I've Tried several ISO Burning programs. I've kept ImgBurn. Thanks for the detailed instruction (w/ screenshots). It appears simple and non-intimidating, but many times proved unsuccessful because I didn't set it up properly. Well, no longer. Detailed instructions help in any endeavor in the computer world. Now I can act like I know what I'm doing. if I lost IP of any access point or router witch program can do scan and find IP us it. I already use Ubntu OS. i tried the above ''ImgBurn'' on windows 7 64bit but always says it is blocked because of compatability. i downloaded ''SPTDinst-v1.78-x64.exe'' but this too didn't solve the problem. what do you think went wrong ! No idea. I regularly run ImgBurn on my 64 bit Windows 7 and it works great. Make sure you're downloading the latest version, directly from the ImgBurn site. I appreciate the advice to avoid toolbars, scans, other "stuff" they offer. It was not easy unless you read closely, unchecked items as needed, and clicked with care...before download *and* during installation. Bloatware everywhere! Does seem to be a really neat program, though. Wish I'd had it before now.